The most important active ingredient that the shiitake mushroom contains is the lentinan (C42H72O36), which comes from its mycelium and is a beta-glucan glucide with a high molecular weight belonging to the polysaccharide class. Lentinan has remarkable medicinal properties and in some countries it is used directly against cancer. Shiitake is very nutritious and rich in protein: it contains all essential amino acids, the most common non-essential amino acids and the eritadenine, a particular anticholesterol amino acid that only this mushroom contains. It is rich in minerals, especially iron, potassium, calcium and zinc. It is an excellent source of vitamin B and E, provitamin D and, in its dried form, vitamin D.
» fight against various kinds of cancer, thanks to the ability of lentinan to trigger the production of Th lymphocytes. 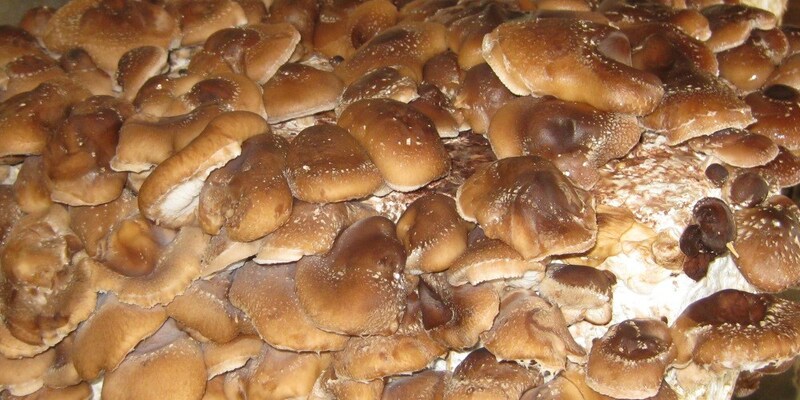 Whereas in Japan and China shiitake mushroom grows naturally on oak trees, with our climate, it is necessary to set up a mushroom bed and provide it with annual cycle bales essentially made with straw and seeds, that are the humus for the shiitake mycelium injected inside. The bales, that we bought already prepared, are organic, and we treat them organically. In fact, the most dangerous enemy for the shiitake is the mould, that we fight (or limit...) with simple vinegar. 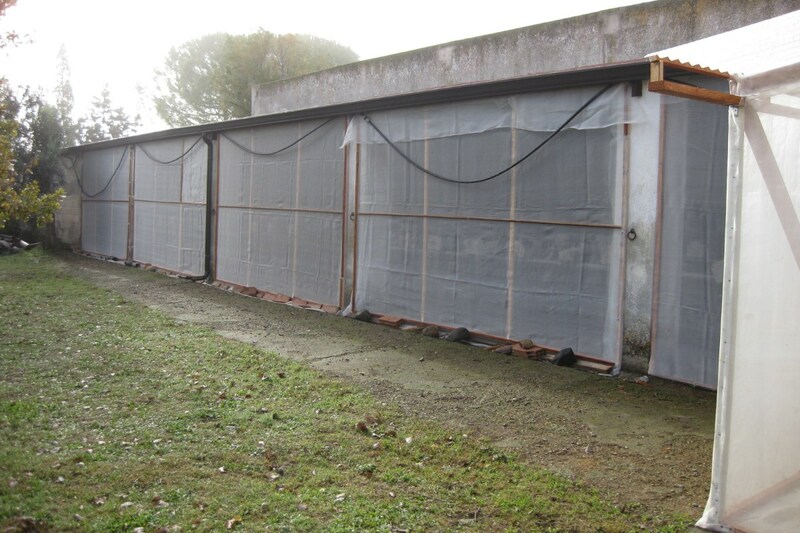 Instead the fight against drosophila, a kind of midge that lays its eggs in the mushrooms, is preventive, in the sense that we have protected our mushroom bed from the external environment through a mosquito net. Between November and February, about every 2-3 days, we collect the shiitake and deliver them in our laboratory, where we cut them into slivers and dry them at a temperature below 40°. 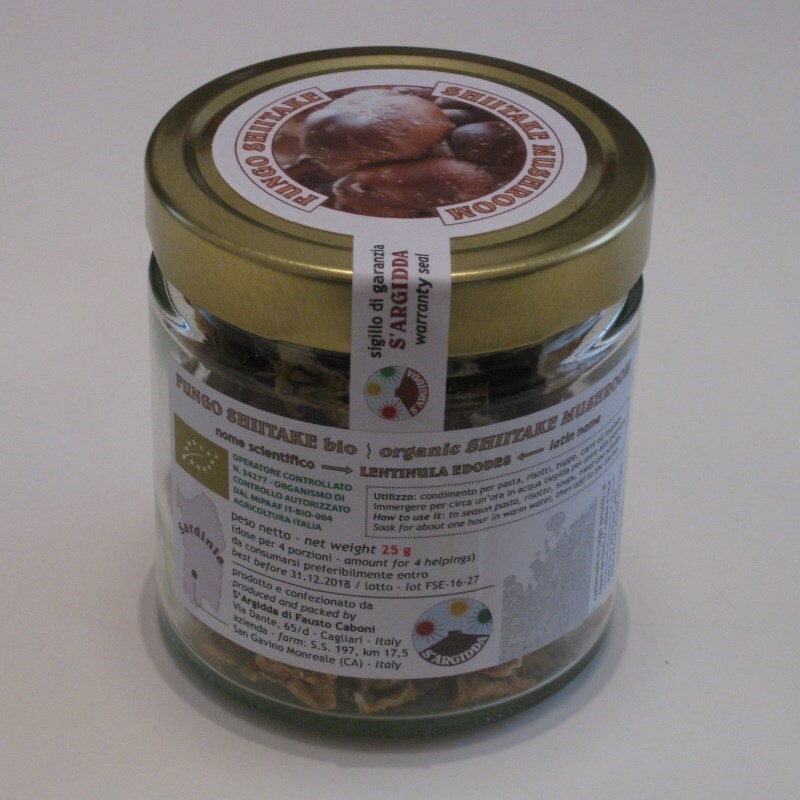 The packaging we propose is the glass jar with 25 grams of shiitake mushroom slivers. 1) How much slivers can I use? The amount of 25 grams is enough to season a dish for 4 people. 2) On what dishes can I use the shiitake mushroom? One of the features of shiitake is its versatility in cooking, however its more common use is to season pasta, risotto, meat and soups. 3) How can I use the slivers? Simply dip the shiitake slivers for about an hour in warm water, so as to soften them, and add them to the dish to season. Our further suggestion is to use in cooking that water too, because inside it there is a part of shiitake active ingredients.